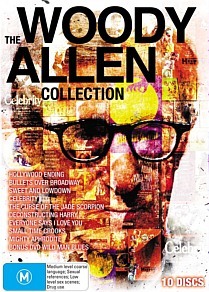 The Woody Allen Collection DVD Review. This is an expansive and important addition to the Woody Allen home media oeuvre, and one which showcases the director’s talents at their most daring and audacious. Heady stuff, and pure film buff heaven. In a remarkable career which now spans no less than six decades, Woody Allen has demonstrated himself to be one of the most gifted, influential and downright prolific filmmakers of all time, still maintaining his famous self-imposed schedule of a film a year and showing no signs of slowing down. Given the enthusiastic reception and numerous plaudits garnered by such recent offerings as Match Point, Vicky Cristina Barcelona and Midnight in Paris, the latter of which won both the Academy Award and Golden Globe for Best Screenplay, now seems the perfect time to revisit the works of the decade which preceded them. Running the gamut from music to comedy to drama to noir-esque thriller and back again, this eclectic set gathers some of Allen’s most widely loved and widely overlooked films, and the satisfaction of having them conveniently housed in the same ‘fatpack’ casing will be a real treat for Allenophiles. (Innumerable Woody Allen box sets of varying worth abound, though there’s never previously been anything of this magnitude or scope available in Region 4, especially for such a comparatively modest price). A further bonus is the appearance for the first time in Australia of the highly-regarded 1996 pseudo-musical Everyone Says I Love You; previously fans on these shores had to fork out upwards of forty dollars for a dusty Region 1 or 2 edition, a fact to which I can personally attest. Then lastly there’s Wild Man Blues, which charts the 1996 European tour of Allen’s jazz band (he’s an accomplished clarinettist) and provides a little-seen glimpse into the private life of Allen and his wife Soon-Yi Previn, whom you may have heard of. This is an expansive and important addition to the Woody Allen home media oeuvre, and one which showcases the director’s talents at their most daring and audacious. Heady stuff, and pure film buff heaven.